Brace yourselves for I am about to show you some finished knitting for the second day in a row. Don’t worry, though, I’m sure it won’t become a habit. 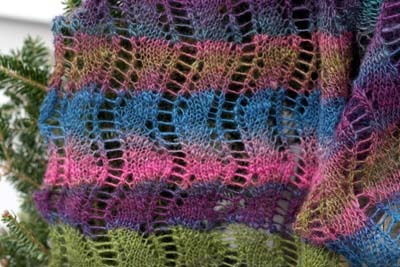 Nevertheless, here we have a finished Lace Ribbon Scarf. Apparently every picture I take these days is modeled on the sled by my back door. Claudia says it’s festive and that works for me. Want to see a little bit closer? Please note the lovely stripes and crispness of the lace pattern. What yarn is it, you ask? Well, the fiber is Gale’s Art BFL that I bought at Maryland Sheep & Wool this past May. Which would mean that this yarn is my handspun. Let me clarify – it’s my handspun singles. I bet that makes you want to see even closer. Right? I have given the scarf to my dear friend Blogless Sharon for her birthday. I figure that only another spinner can really appreciate a gift knit from handspun singles and I still feel bad about going to Maryland without her. The grin on her face when I gave it to her last night makes me think that she has forgiven me. It’s beautiful. You did a great job on the knitting and the spinning. BTW – love the snow. What a beautiful scarf and such a wonderful gift. 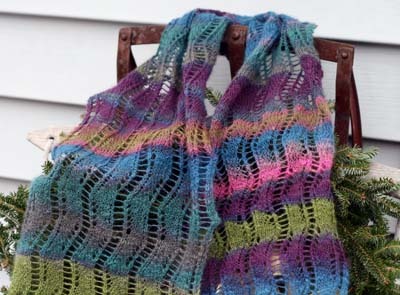 The scarf is beautiful…and out of your own handspun singles – that is truly a special gift. I am sure Sharon loves it! Handspun and singles = beautiful, beautiful scarf and a lucky and appreciative friend. This is a nice bonus for having to miss the festival. What a beautiful gift! Carol- I don’t want you to worry but it is snowing on your blog! OMG!!!!! Your blog is snowing!!!!! I love it! yay! you used your yarn! it’s lovely and i love the snowing blog. good thing it’s not icy. oooooo, and ahhhhhhhhh, and oooooohhhhhh…that is so pretty, Carole! It reminds me of candy. It’s beautiful! Sharon is so lucky. The scarf is wonderful. I have purchased a skein of homespun yarn once on ebay. While we may not all be able to spin, knitters have a true appreciation for the art of spinning and feel very fortunate when they are able to knit with it. This scarf was pretty enough for an Eye Candy Friday. That is so lovely! 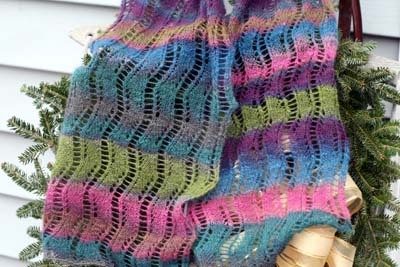 It makes me want to give a go with knitting my singles. Beautiful! You have a lucky friend.